While not being a television in the strictest sense of the word, Netflix has revolutionized the way we use our TV. No ads, no commercials, and the ability to binge-watch your favorite shows from start to finish in only one sleepless night, there is no person alive who doesn’t enjoy a little Netflix, with or without the added chill. Problems start after a little while when you have already caught up with your favorite shows and have already seen the top movies proposed by Netflix and now need to spend increasingly more time to find something good to watch. There are a couple of weird software solutions from the platform where the shows you have abandoned in Season 1 Episode 2 are constantly popping out for you to continue and where most things from the database, even the ones that are available to you, are hidden behind a wall of recommendations. This is on top of the fact that even though you have Netflix in your country, it will not be the same one that is seen by people in the US, or the UK, countries with the biggest content databases. Due to either licensing or national ratings policy, some content is not available when you are connecting through the public IP, meaning that you will be cut off from roughly 25% of shows and movies if you are outside of the US. Because of this difference, you will need to use VPN for Netflix, and VPN providers such as Le VPN offer dedicated media connection to make your streaming over VPN as seamless as possible. Why do You Need Netflix Hacks? Thankfully, to ‘’hack’’ Netflix, you don’t actually need to brute-force any servers from a multi-billion tech company, and if you are able to do that you are probably already working for Facebook, Google, and probably CIA on the side. These hacks are little secrets that are actually available on the platform and are really easy to do but are not advertised or available from the get-go. These secrets give you a long list of benefits, such as watching US content but also watching it in higher definition, clearing out your library, selecting secret genres, and more. 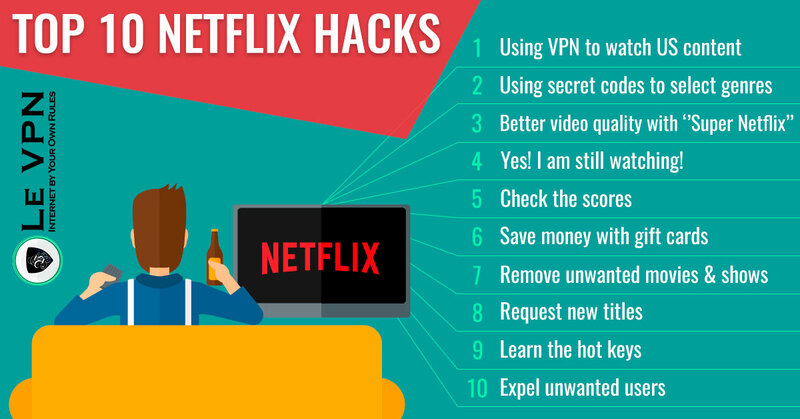 We have compiled a list of best Netflix hacks that are easy to use and install and which will revive the viewing experience you have had the first time you have started using the streaming service. Some of these hacks are useful wherever you are, and whenever you want to improve your experience, while others are crucial when you are traveling, or when you want to avoid intricate international licensing and just watch your favorite shows wherever you are. Why do Different Countries Have Different Shows on? Media production companies invest millions in the production of movies and TV shows and sometimes spend even hundreds of millions in promoting those movies worldwide and making lucrative licensing contracts with domestic partners. They are usually trying to protect their investment by not giving away rights to companies such as Netflix, or at least not right away. As the US is a much bigger market and Netflix makes a significant part of the income of many media companies nationwide, most content is available in the US first, than in the UK, and much later anywhere else. Apart from licensing, domestic regulation is a large factor in some movies and TV shows being unavailable. Some countries and their regulators frown on different genres for many different reasons. Either under pretenses of public health, morals, religious beliefs, or similar excuses, some content is not allowed in some countries, and other countries don’t have Netflix altogether. Because of these differences, you will need to have a solid Netflix VPN connection as to follow your shows wherever you go. If you have a good VPN provider, this part is quite easy. You can connect to Netflix USA just by choosing a US-based server and unlocking all of the content available in the States. With premium VPN providers such as Le VPN, you will also have dedicated connections and servers for these purposes that will give you higher speeds and lower ping than you would have with a basic proxy or a lower end VPN service, meaning that you will be able to watch your content with ease. To unblock Netflix US libraries with Le VPN, all you need to do is simply active the “HybridVPN DNS” in your Le VPN app, and connect to ANY server in ANY country. Once your Le VPN app says “Connected” with the “HybridVPN DNS” box checked, Netflix thinks that your device is in the US and their vast American library is now yours! While this practice might be frowned upon by local distributors, who usually offer a much lower service than Netflix, it is not illegal in any way, and you will not be hurting the producers of your favorite shows as your viewing will enter the metric and finance the creators. It is nowhere near pirating or stealing content. Although for most users the content based in the US and UK will be the biggest, they are not actually the ones with the most titles. In the last couple of years, Netflix has invested significant funds into the licensing of Japanese style animated movies, also known as anime, which has been gaining popularity not only in the US but worldwide. As these shows are bound to lag behind the Japanese market due to copyright or the idea that there isn’t enough demand in the US, you might be happy to know that you can watch these shows if you change your VPN location to a Japanese server. Same as with the HybridVPN unlocking American databases, the Japanese server will unlock the biggest Netflix database on the Planet to date. And no, don’t worry; watching anime will not make you a weeaboo, this only happens when you try to act Japanese and fail miserably. Once you have filled the Netflix algorithm with a few shows, you will have your recommended titles tied to you with ratings, only showing shows that the company calculator thinks you will like. Watched an Adam Sandler movie once? You will probably want to see everything him and Kevin James have ever made in the lifetime. Resistance is futile. Even if you like a genre, a producer, or an actor, you don’t want to see the same person and story every day. This is where secret Netflix genres come to shine, as there is a long list, sometimes called the ‘’Netflix Bible’’ where all the codes are listed, and which you can use in your search bar to filter very specific genres. You just need to enter the code you want, like you would to search a title, and the platform will provide you with only the titles that are tagged with the specific genre. Some of the codes give out very familiar titles and genres, such as 1372 showing Sci-Fi & Fantasy Television, while other codes such as 7153 give out only romantic movies produced outside of the US. You can check all of the codes in ‘’The Bible’’ and write down your favorites. Also, if you are using Chrome, there is an extension. Although there are many browsers which are not as taxing on your device as is Chrome, this is one of the best browsers if you want to have everything you need at only a few clicks away. If you don’t want to bookmark the Netflix ID Bible in the top bar, you can always install a Chrome extension that will give you all the genres, listed right there in the corner. The ‘’FindFlix: Netflix Secret Category Finder’’ is easy to install and easy to use, and it can help you to streamline your viewing experience a little better. There is a possibility that some categories are not available in all countries, meaning that you should still be using your VPN app with HybridVPN add-on for the US library to access everything that you need. While your usual feed will still be overrun by the software predicting your taste, you will now also be able to search exactly what you want at the moment. If you are using Google Chrome, a category finder is not the only extension that you can use. The aptly named ‘’Super Netflix’’ goes directly into your Chrome feed and improves your experience immensely. All options that Super Netflix gives you are easily accessible from the top-right bar, by clicking on the extension button. If you are at home, using your Wi-Fi or even Ethernet connection, you will want the best quality video to project to your television set, giving you the most out of your viewing experience. On the other hand, if you are on the road, using slow Wi-Fi or even your mobile data, you will want to save up on that traffic and download the show quickly, what you can do by lowering the resolution of the video. Using this extension, you can also change the brightness and contrast settings on the video that you are watching. Maybe you are outside on a sunny day, and you want to see everything that is going on in an especially dark episode of Stranger Things. Also, you might want to dial down the brightness when you are watching at home during nighttime, as to go easy on your eyes. Using Super Netflix, you can select to skip all intros in the effort to save time. The extension will also blur any spoilers and descriptions, as not to ruin your experience. You are cozy under a blanket, sinking deep into your couch, binging your favorite show. Then, the dreaded question comes: Are you still watching? While this Netflix feature is sensible, as there is a high probability of falling asleep at some point during the show, losing track of your progress, sometimes you just want to turn off this feature and enjoy your program in peace. ‘’Never Ending Netflix’’ is a yet another Chrome extension that will help you improve your experience. It can automatically play next episodes and remove the prompt if you are still watching, Although this is a fairly small change to the code, breaking emersion is something that you don’t want to do, and NEN will clear that problem quickly and easily. Netflix uses a strange metric to rate their content, as it is a mixture of user ratings and software prediction. While some believe that this change was introduced due to the Amy Schumer comedy special debacle, this was actually done prior to that show to try to give the users the best content for them, and not necessarily the best content rated overall. Be that as it may, you might want to check IMDB scores as well as drop-off rates of shows and movies you are planning to watch by using the ‘’Netflix Enhancer’’ that will provide you with all the info you need to know if this is the right flick for you. Apart from Netflix, this extension also works on Hulu and Crunchyroll, which both have a similar rating feature. This is more of a life-hack than a technical hack of Netflix experience. Buying Netflix over a gift coupon or a certificate can lower your monthly bills and save you some extra cash, maybe for a late night pizza with your significant other. Using services such as Raise.com you can buy gift cards, which are meant to be bestowed upon on other but can just as easily be a gift from you, to you, for a service you know you will use. Different suppliers will give out different discounts, but you will always be able to get at least 10% off your purchase. There are two types of highlighted content on Netflix that we all despise. First are the bad shows that the service constantly reminds us that we have not yet watched. The second is the guilty pleasures that you don’t really want other people to see. Thankfully, this is an easy solution, and it can even improve that Sandler-imposing algorithm, as the only thing you need to do is to go to your Viewing Activity and delete all the shows that you don’t want popping back up into your feed. While people will still be able to accuse you of watching too many romantic comedies, there will be no evidence. Even though the Netflix content database has over 76000 titles in its library, not all titles are included. Whether it is because of licensing, or just a title that Netflix doesn’t think that there is enough demand for, you can probably think of a movie or a show that you would like to see, but that is not on the platform. Not too many people know that there is actually a way to appeal to Netflix to add new titles and propose exactly which titles would this be. By going to the request form, you can cite up to three titles of the movies and shows you would like to see. While it is improbable that Netflix will add those titles on your word alone, if enough people cite the same show, it will probably be added to the library. If you are using a PC, you will need to know how to use hot-keys. This will speed up the way you use your Netflix and remove the troublesome moving of a wireless mouse over your couch. – F will change your view to full screen. – Esc will take you out of full-screen mode. – PgDn will pause the show. – PgUp will play the video. – You can also pause and play using the Spacebar. – Shift + Right Arrow will fast-forward the video. – Shift + Left Arrow will rewind. – The M key will mute the video while still letting it play. Although this could be seen as a step further from breaking up with someone using a text message, you probably have half of your friends and a quarter of your family using additional slots on your Netflix account. To delete these mooches from your account, you just need to go to My Account and select Sign out of all devices. After this you can change your password and log in again, leaving all the unwanted leaches detached. While Netflix is an awesome service, it is not without its flaws. Thankfully, there is enough of a user base for this platform that all secrets will be revealed sooner or later. You will definitely want to use a good VPN provider, such as Le VPN, that has a dedicated media server in the US, as to watch US exclusive content, and you can further better your experience by using Chrome extensions. That, with a couple of tricks, will make your binge-watching as relaxing as possible. While you should use a VPN for security in general, and there are significant benefits of knowing how your browser works beneath the hood, these benefits also work in your downtime, relaxing over your favorite TV program.